Background There is randomised controlled trial (RCT) evidence that neuromuscular training (NMT) programmes can reduce the risk of injury in youth soccer. We evaluated the cost-effectiveness of such an NMT prevention strategy compared to a standard of practice warm-up. Methods A cost-effectiveness analysis was conducted alongside a cluster RCT. Injury incidence rates were adjusted for cluster using Poisson regression analyses. Direct healthcare costs and injury incidence proportions were adjusted for cluster using bootstrapping. The joint uncertainty surrounding the cost and injury rate and proportion differences was estimated using bootstrapping with 10 000 replicates. Results Along with a 38% reduction in injury risk (rate difference=−1.27/1000 player hours (95% CI −0.33 to −2.2)), healthcare costs were reduced by 43% in the NMT group (−$689/1000 player hours (95% CI −$1741 to $234)) compared with the control group. 90% of the bootstrapped ratios were in the south-west quadrant of the cost-effectiveness plane, showing that the NMT programme was dominant (more effective and less costly) over standard warm-up. Projecting results onto 58 100 Alberta youth soccer players, an estimated 4965 injuries and over $2.7 million in healthcare costs would be conservatively avoided in one season with implementation of a neuromuscular training prevention programme. Conclusions Implementation of an NMT prevention programme in youth soccer is effective in reducing the burden of injury and leads to considerable reduction in costs. These findings inform practice and policy supporting the implementation of NMT prevention strategies in youth soccer nationally and internationally. Sport is the leading cause of injury in youth, accounting for >30% of all injuries.1–4 The estimated annual injury incidence proportion of medically treated injury in youth sport is 35 injuries/100 youth.5 ,6 Sport injury also leads to decreased sport participation and associated morbidities.7 ,8 As such, reducing the public health burden associated with injury in youth sport is critical. Unintentional injuries cost Canadians $22.1 billion in 2010, with direct healthcare costs accounting for 60% of this burden.9 The combination of high sport-specific participation and high injury incidence rates leads to the highest burden of injury in youth sport. A cost-effectiveness analysis was conducted alongside a cluster RCT.17 Incidence rates (IRs) and healthcare resource use were collected prospectively throughout one complete indoor soccer season.11 Study participants were male and female, ages 13–18 years, participating in the 2006/2007 indoor soccer season (tiers 1 or 2, U13–U18). Details regarding recruitment, study group characteristics, sample size and injury surveillance are described in the original RCT paper.11 All (n=744) participants from the RCT study were included in this cost-effectiveness analysis. During the soccer season, soccer-related injuries that required medical attention resulted in the inability to complete a session or in time loss from play were recorded and followed up by the research coordinators for up to 6 months following the end of the season. Injury mechanism, time loss, medical follow-up and therapist and physician assessments for each injury were documented on an injury report form (IRF).11 Injury incidence rates (number of injuries/1000 player hours) during the soccer season were reported for the training and the control groups. Injury proportion (number of injuries/100 players) was used to allow for interpretation by coaches, players, parents and administrators. Healthcare resource use was measured based on the IRF, including the total number of visits to healthcare professionals, specific treatments, services, quantities of supplies and equipment used by injured players on an item-by-item basis. The costing analysis was performed from the healthcare perspective. These costs were broken down into public (ie, direct costs to the healthcare system) and private costs (ie, including the out-of-pocket medical costs incurred by players and their families). The costing analysis also included some costs beyond the healthcare perspective (ie, intervention costs). Current (2015) unit costs from the Alberta Health Service-Calgary Zone were applied to value the healthcare system resources used by injured players, including visits to physicians, emergency departments, surgery, X-rays, scans and casts. Unit costs for the out-of-pocket healthcare costs borne by families, including fees for physiotherapy, athletic and massage therapy, acupuncture, chiropractic, splints, braces, crutches and tensors, were collected by contacting various local providers of such services and products. All costs were adjusted to 2014 Canadian dollars (CAD) using the consumer price index, 2009 basket (annual (2002=100), Geography=Canada, Commodities and commodity groups=Healthcare).18 We did not include transfer costs, such as goods and services tax. The cost of injuries/1000 player hours and cost of injuries/100 players were used as estimates of healthcare costs for each team. In the base case analysis, the total cost for the training group was calculated by summing costs of all healthcare resources documented in the IRF and intervention costs associated with delivering the prevention strategy. Intervention costs included wobble board costs ($20 per player) and training session costs ($35 per hour×2 h per team). The total cost for the control group was calculated by summing the costs of all healthcare resources documented in the IRF. We calculated the mean cost per injury as the total cost divided by the total number of injuries in each group. If the NMT strategy was ‘dominant’ (ie, the training group demonstrated lower costs and lower injury incidence rates and proportions), an ICER was not calculated. To quantify the uncertainty surrounding the point estimate of the ICER, we examined the joint density of cost and injury rate differences.20 The joint uncertainty surrounding the cost and injury rate differences was estimated using bootstrapping with 10 000 replicates plotted on a scatterplot (cost-effectiveness plane). The estimates were obtained by multiplying the mean number of injuries per player and the mean cost per player for each group in our study by the number of youth soccer players registered in Alberta in 2013 (n=58 100).21 This is a conservative estimate given that 75% of players are expected to play at least one season (indoor or outdoor) in 1 year.10 We estimated the difference between the projected injuries and costs based on the training group and control group data to obtain the injuries and costs that would have been avoided with the prevention strategy. Calculations and statistical analyses were performed using Microsoft Office Excel 2010 and Stata/IC V.11.2 (StataCorp. Stata Statistical Software: Release 11.2. College Station, Texas, USA: StataCorp LP, 2012). Injury incidence rates were estimated with 95% CIs using an intent to treat multivariate Poisson regression, including player hours as an offset, adjusting for clustering by team, age group and previous injury. As the cost and number of injuries/100 players data were not normally distributed, bootstrapping with 10 000 replications was used to estimate 95% CIs around the mean costs and injury incidence proportions, accounting for clustering effects by team and adjusting for the age group and previous injury. In a cluster RCT, evaluating a similar NMT strategy in female youth soccer (FIFA 11+) without the use of any wobble boards, a protective effect (32% reduction in injury risk) similar to this study was reported.12 Further to this, a 57% reduction in injury risk was found in female players in Alberta (ages 14–18) using the FIFA 11+ for players who demonstrated the greatest adherence to the programme (upper tertile by total warm-up sessions completed).15 The 11+ programme training videos are available online.22 As such, a sensitivity analysis was conducted in which the intervention costs (wobble boards and training session) were excluded from the total cost for the training group. Thirteen of a total of 129 injuries (10%) were missing details related to healthcare resource use. Since the type of injuries was available for all observations, we estimated missing data using simple imputation of healthcare resource use for the same types of injuries. Subsequently, these imputations of resource use were confirmed based on consultation with sports injury physicians. We assumed that all emergency department visits took place at paediatric hospitals, and that players were not admitted to the hospital. We also conservatively assumed the use of upper-extremity fibreglass casts, enabling players to return to play as soon as possible with a cast, and off-the-shelf braces (specific to injury location and type). Costs associated with the use of tape, medication, first aid, heat and ice were not collected and were not included in our analyses. The distribution of baseline characteristics (including age, height, weight, history of injuries) was similar in the training and the control groups, although a greater proportion of female players was observed in the control group.11 The total number of injuries and participation hours are presented in table 1. The number of healthcare resource units consumed by injured players and their total accumulated direct healthcare costs are presented in table 2 with a breakdown of the costs by group in table 3. The total cost of healthcare resources used in the training group was $21 957 (95% CI $14 131 to $32 083) compared with $37 806 (95% CI $18 039 to $62 661) in the control group. Public costs were 10% ($2271) and 29% ($10 956) of the total costs in the training group and control group, respectively. The mean cost per injury did not differ significantly between training ($443, 95% CI $320 to $584) and the control ($477, 95% CI $263 to $754) groups (table 3). The estimated total cost/1000 player hours was 43% lower in the training group ($913, 95% CI $609 to $1334) than in the control group ($1602, 95% CI $775 to $2618) (table 4). 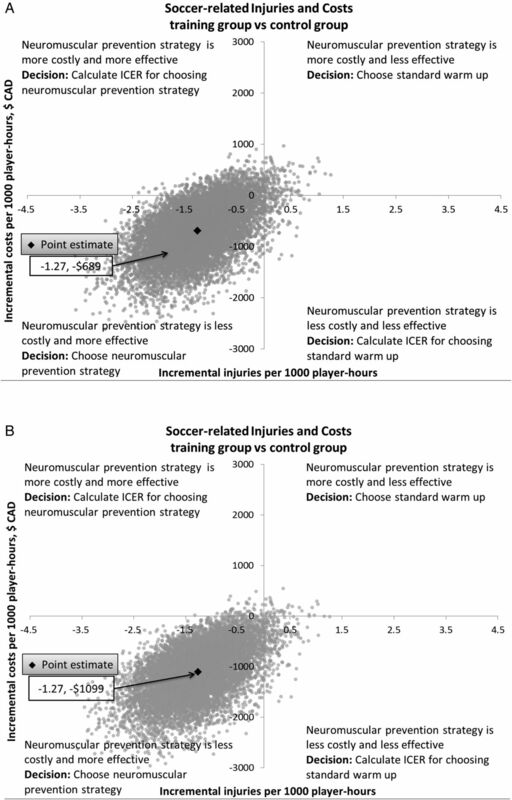 The difference in costs between a neuromuscular strategy and a standard warm-up (incremental costs) was estimated at −$689/1000 player hours (95% CI −$1741 to $234) (table 4). Similar patterns were observed when estimating the difference in costs/100 players. In the sensitivity analysis, when not including the intervention costs, the total cost of healthcare resources used in the training group was $12 127 (95% CI $4830 to $21 982). And the mean cost per injury was almost two times lower in the training group ($239) than in the control group ($477) (table 3). The estimated total cost/1000 player hours was almost two times lower in the training ($913, 95% CI $609 to $1334) than in the control ($1602, 95% CI $775 to $2618) group (table 4). The difference in costs between a neuromuscular prevention strategy compared to a standard warm-up (incremental costs) was estimated at −$1099/1000 player hours (95% CI −$2145 to −$180). Similar patterns were observed when estimating the difference in costs/100 players. Injury incidence rates and proportions for each group are presented in table 4.The overall IR was higher in the control group (3.35 injuries/1000 player hours) compared with the training group (2.08 injuries/1000 player hours). The incremental injury rate in the neuromuscular group compared with the control group was −1.27 (95% CI −2.2 to −0.33) injuries/1000 player hours). Similar patterns were observed for the number of injuries/100 players. Cost-effectiveness plane scatterplot displaying costs and injuries for a neuromuscular prevention strategy incremental to a standard warm-up for 10 000 bootstrap iterations for (A) base case analysis and (B) sensitivity analysis. Table 5 displays the number of injuries and costs that we expect to have occurred during one typical soccer season in Alberta if a standard warm-up continued, compared to the estimated injuries and costs we expect to have occurred if a neuromuscular prevention strategy was implemented. In the base case analysis, among 58 100 youth soccer players, we estimated that 4965 injuries and over $2.7 million in healthcare costs would have been avoided with neuromuscular prevention strategy in just one season. In the sensitivity analysis, over $4.2 million in healthcare costs would have been avoided with a similar neuromuscular prevention strategy in just one season in a programme not requiring wobble boards or training session. In addition to a 38% reduction in injury risk in youth soccer players participating in a neuromuscular training programme,11 healthcare costs incurred by youth soccer players participating in such a programme were reduced by 43% compared to those who do not participate in a soccer-specific neuromuscular training programme. Thus, this NMT prevention strategy in youth soccer is effective in preventing soccer injury and also reduces costs compared to standard of practice warm-up. While other studies have demonstrated the effectiveness of neuromuscular training strategies in youth soccer,11 ,12 ,15 ,16 this is the first study to report injuries and the direct healthcare costs associated with these injuries. In an adult male amateur soccer population, an RCT demonstrated no overall preventative effect in reducing injury risk within one season, but did significantly reduce injury-related costs.20 Cost differences in favour of the intervention group were reported per player (mean difference €201, 95% CI €15 to €426) and per injured player (mean difference €350, 95% CI €51 to €733).23 Krist et al23 used ICERs and cost-effectiveness planes, however exposure hours were not considered, limiting the comparability of results to this study. Another cost-effectiveness analysis in sport injury prevention evaluated a proprioceptive training programme to prevent ankle sprains among volleyball players using direct and indirect costs.24 The reduction in ankle injury risk was 45%, but the total costs reported in this study per player (including the intervention material) were significantly higher in the intervention group (€36.99 (93.87)) than in the control group (€18.94 (147.09)).24 The authors conclude that the introduction of a proprioceptive balance board training programme to prevent ankle sprains requires financial investment in the short term.24 As demonstrated with the sensitivity analysis in our study, the implementation of prevention strategies (eg, FIFA 11+) that do not require equipment may be the best approach when considering the cost-effectiveness of such programmes. The results of our study were projected onto the 58 100 youth soccer players in Alberta registered with the Canadian Soccer Association in 2013. It was estimated that 4965 injuries and over $2.7 million in healthcare costs would have been avoided with neuromuscular prevention strategy in just one season. In the sensitivity analysis, over $4.2 million in healthcare costs would have been avoided with neuromuscular prevention strategy in just one season in a similar neuromuscular training programme not requiring equipment. This is an underestimate of avoided costs, given the additional youth soccer participation in schools and recreational contexts where registration with Canadian Soccer Association is not required. In a similar cost-effectiveness analysis in youth ice hockey in Alberta, evaluating the cost avoidance in delaying body checking from age 11 to age 13 it was projected that 1273 injuries would be avoided in 11 and 12 year old hockey players annually and $213 280 in healthcare costs would be avoided.26 In both studies, an assumption is made that the IRs and resource use patterns of players in rural Alberta would not differ from those playing in the city. A neuromuscular training prevention programme in youth soccer reduced the burden of injury reducing costs by over $2.7 million. These findings will inform practice and policy supporting the implementation of neuromuscular training primary prevention strategies in youth soccer nationally and internationally. First study to evaluate cost-effectiveness of a neuromuscular training prevention warm-up programme in youth sport. The neuromuscular training prevention programme in youth soccer reduced the burden of injury (38% reduction in injury risk) and reduced healthcare costs by 43%. There is a 90% likelihood that the neuromuscular prevention strategy is dominant (ie, the training group demonstrated lower costs and lower injury incidence rates and proportions) compared to standard warm-up. Projecting results onto Alberta youth soccer players, implementation of a neuromuscular training prevention programme would prevent approximately 5000 injuries and save over $2.7 million in healthcare costs in one season. The neuromuscular training prevention strategy in youth soccer can prevent soccer injury and also reduce costs compared to standard of practice warm-up. These findings should inform practice and policy supporting the implementation of neuromuscular training primary prevention strategies in youth soccer nationally and internationally. The University of Calgary Sport Injury Prevention Research Centre is one of the International Research Centres for Prevention of Injury and Protection of Athlete Health supported by the International Olympic Committee. This study was funded by Alberta Innovates Health Solutions, Canadian Institutes of Health Research and Alberta Children's Hospital Research Institute. Carolyn Emery is supported by an Alberta Children's Hospital Foundation Chair in Pediatric Rehabilitation. Deborah Marshall is supported by a Canada Research Chair, Health Systems and Services Research and the Arthur J.E. Child Chair. Sarah Lacny and Elena Lopatina were supported by funding from the Arthur J.E. Child Chair. The role of the sponsors and funding bodies was to provide financial support for this research and the translation of the findings to all community partners.
. Injuries in Canada: insights from the Canadian Community Healthy Survey. Statistics Canada, 2011.
. Sport participation, sport injury, risk factors and sport safety practices in Calgary and area junior high schools. Paediatr Child Health 2009;14:439. Parachute, The Cost of Injury in Canada. 2015, Parachute: Toronto, ON Version 2.1.
. Protection of the elite athlete is the responsibility of all of us in sports medicine. Br J Sport Med 2015;49:1089–90.
. Evaluation of how different implementation strategies of an injury prevention programme (FIFA 11+) impact team adherence and injury risk in Canadian female youth football players: a cluster-randomised trial. Br J Sport Med 2013;47:480–7. Statistics Canada. CANSIM Table 326–0021: consumer price index, 2009 basket. Annual (2002=100). http://www5.statcan.gc.ca/cansim/a05. 2015.
. Methods for the economic evaluation of health care programmes. Oxford university press, 2005.
. Using and interpreting cost-effectiveness acceptability curves: an example using data from a trial of management strategies for atrial fibrillation. BMC Health Serv Res 2006;6:52. Canadian Soccer Association. 2013 Annual Report. 2013.
. Reality check: the cost–effectiveness of removing body checking from youth ice hockey. Br J Sport Med 2014;48:1299–305. Contributors DAM contributed to the conception and design of the cost-effectiveness analysis, the analysis and interpretation, drafting of the article, provided final approval and agrees to act as a guarantor of the work; EL contributed to the cost-effectiveness analysis and its interpretation, drafting of the article, provided final approval and is the guarantor; SL contributed to the cost-effectiveness analysis and its interpretation, reviewed the article critically, provided final approval and is the guarantor; CAE contributed to the acquisition of the data, design of the cost-effectiveness analysis, the analysis and interpretation, drafting of the article, provided final approval and is the guarantor. Funding Canadian Institutes of Health Research, Alberta Innovates Health Solutions, Arthur J.E. Child Chair. Ethics approval University of Calgary, Office of Medical Bioethics.